Time schedules our day. This is obvious. We get up at a particular time, we get to work or meet people at specified times. We might like lunch at midday or one o’clock or one thirty. If we are late to appointments, we run the risk of missing the person we want to see. We might set ourselves a bed time. Modern medicine asks us to count the number of hours we have been sleeping. Within a time zone, we experience a particular time together. Rush hours unite us in traffic jams, we’re probably all eating dinner between 6pm and 8pm. Time also divides us. There are as many perspectives on the present as there are people in the world. At any one time someone could be overjoyed while someone else is in deep despair. Events are happening, people are dying and being born, our whole world changes every second. Finally, time is running out. We don’t have forever. 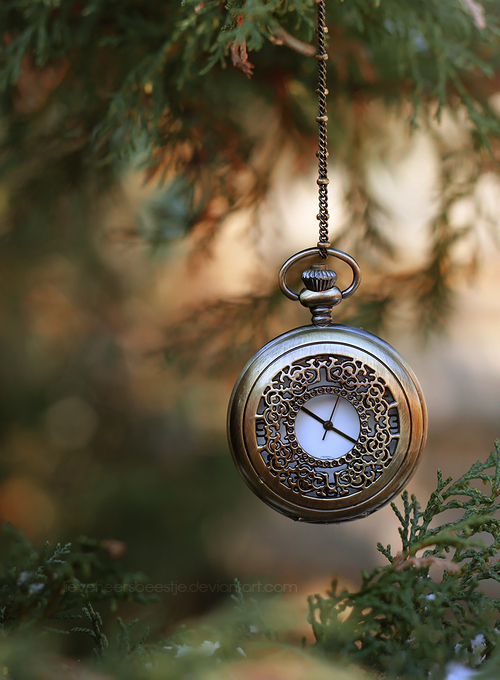 Time reminds us of the transience of life, of death. 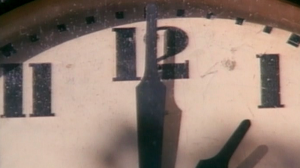 Themes around time are explored in Christian Marclay’s The Clock which is currently showing for the first time in the Southern Hemisphere at the Museum of Contemporary Art in Sydney. The Clock represents each second of 24 hours with footage from over a thousand clips which represents a particular time of day. 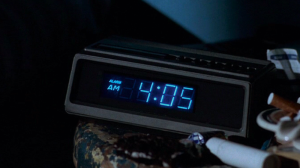 If you are watching the film at 2am, you will see clips referencing 2am. If the current time is 10.43pm, the clips will reference 10.43pm exactly. A second in real life is a second on film. And you know this because the film may include a clock face, a timer at the corner of a TV screen, a discussion of age, a sundial, or a verbal proclamation of the time. Bells chime, alarms go off, the time is stated when a man is pronounced dead. Sometimes the puzzle is trying to find how each clip refers to the time, sometimes it’s obvious and the time is central to the frame or the dialogue. I first watched the film from 1pm until 1.30. There were many clips of lunch time, people eating or preparing lunch. Scenes from restaurants dominated during this time. I also saw cars driving, people rushing to appointments, close-ups of clocks without any further context, people bawling at news they heard, a sleepy few still in bed. Aside from being a generally impressive undertaking, the film is cut incredibly well. A door may close at the end of one clip and open at the start of the next. Sometimes it isn’t clear when one clip ends and the next starts. Sometimes the clips repeat themselves and themes emerge about what someone does at any particular time. Often these themes transcend a particular space or era as the footage Marclay uses is drawn from a range of periods and places. The Clock is strangely compelling. While there is no set narrative, the audience is left to reflect on the way time mediates their life. It is both enthralling and anxiety-inducing to have time so immediately represented. 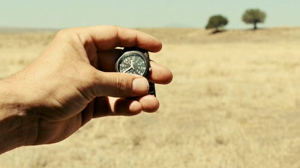 Unlike most good films, you can’t get lost in The Clock, by design it doesn’t let you – every second is passing on screen and the film asks you to take notice. In an odd sense, the film further unites your present to that of the characters. The time on screen matches the time displayed on your watch or phone. The effect is one of both amusement and connection to a broader reality that your immediate experience. Peter Bradshaw of the Guardian has called The Clock, ‘a masterpiece of our times’ [pun surely intended] while Adrian Seale (also of the Guardian) has said it is ‘the most staggering, complex thing made by any artist so far this century.’ These reviews, in my opinion, are a little over the top, but it is nonetheless a fantastic achievement and a great experience that I would highly recommend anyone whose curiosity is sparked to go have (probably best not to view all of it though, unless you’re really keen). The Clock is screening at the MCA until June 3 during normal museum hours except for Thursdays where it screens overnight (the café will be open for the required caffeine to view the night time scenes). This entry was posted in Art, Arts and tagged art, events, film, gallery, Review, sydney, the clock. Bookmark the permalink.